You are here: Home / Topics / Build More Power / Shin Soo Choo VIDEO: Can Front Arm KILL Bat Speed? Shin Soo Choo Missing Power? Shin Soo Choo is well-above average when it comes to On-Base Percentage, .389 over a ten-year span. He also averages 37 doubles per season over the same career span. However, his 162-game average for home-runs is ONLY 19. How-to increase rotational speed at home. She moves her arms into her center of rotation (Rotating speed increases, moment of inertia decreases). To go slower, she moves her arms and a leg away from her center of rotation (Rotating speed decreases, moment of inertia increases). Moment of Inertia (or MOI) just means a body’s tendency to resist angular (rotating) acceleration. Rotating speed and the moment of inertia have an inverse relationship. 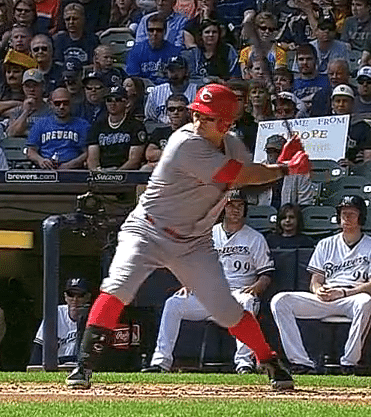 How Shin Soo Choo May Be Dumping Bat Speed Pre-Impact? Plane the pitch is arriving on beforehand. Unlike golf, hitters have a split second to commit and accelerate their barrel. So in the first part of the Final Turn, a hitter MUST accelerate the barrel quickly with the torso using a bent front arm. The second part of the Final Turn – when the barrel gets on plane of the pitch – the front arm begins to straighten to increase the moment of inertia (resisting rotational acceleration). And of course, the front arm straightening at impact will depend on pitch location…lower or outside the zone, more straight at impact…versus, inside or higher, more bent at impact. 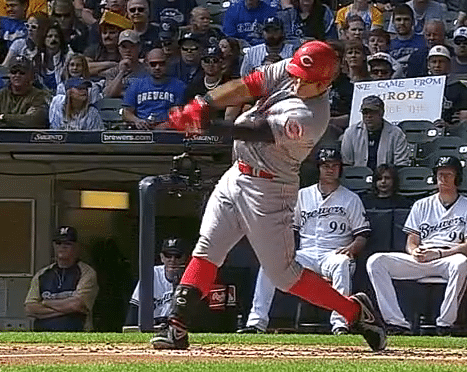 A hitter’s post-impact objective, MUST be to get both arms extended. This would ensure proper transition of Centripetal (center-seeking) v. Centrifugal (center-fleeing) Forces. Therefore, keeping the front elbow bent from the start of the Final Turn is critical to increasing turning speed and barreling the ball, particularly in high EV zones (Effective Velocity – Perry Husband). Keep a slight bend in the front arm. Fixing this can take Shin Soo Choo’s 162-game average of 19 homers to over 30 for sure. Basically, it makes his swing more adjustable to higher perceived velocities, if we’re talking about Perry Husband’s EV system. There is a theory I have developed in the last 2-3 years, which is so different from anything else I have seen, that I feel a need to share. The difference is not so much in how to instruct a player to swing the bat — but rather in observing what the players’ BAT is doing — and why — as it moves through 3d space. Due to certain factual principles in physics, the bat must be thought of in a new way. It must assume a much more important role in the elite swing. swinging a bat correctly, and with maximum power and quickness, involves a give-and-take through the chain of movements, in the sequence of swinging. There are passive and active movements between player and bat, which result in a “balanced” swing. After all, the bat is not part of the person — it is best thought of as a cylinder of a certain length which when rotated in certain ways, does some peculiar things. When a cylinder is rotated by two forces, on perpendicular planes, it behaves in a rather nonintuitive way. Any attempt by a player to copy what is happening in the elite swing, will result in minimal success, if not outright failure, because the focus is on the wrong thing. It is natural for humans to be self centered. It’s also natural for a player to think about hitting in terms of utilizing the bat, as a tool, as an extension of themselves. This puts the focus on the player’s body… their muscles, their bone structure, their stance, their footwork, their hand position, etc. By focusing on these things, it instills within the individual the belief that within themselves exists all there is needed to develop into a good hitter. The problem with thinking that way, is that there are so many body types, so many levels of strength, so many levels of flexibility, etc. Before I Coach can really tell a player how and what he should do, the coach or instructor has to analyze his body type, his strength, and a variety of other factors, pertaining to the individual. It’s very complicated. Although individual instruction is something that will always be needed to a certain degree, current instruction tends to be unnecessarily difficult to explain to a group of players. That is why we see so many arguments regarding the instruction of how to swing. It’s because nobody seems to have the High ground. The human body is capable of so many many movements, there are so many parts involved, there’s so much going on under the hood that to try to encapsulated it in a teaching method is folly. The understanding of the physics involved in the complex movements between player and bat are the key. Thinking from this vantage point, enabled one to explain several things that are currently debated ad nausea — debates that seem to be locked in a never ending spiral of thinking, with no clear winner. George- Can you please elaborate on what exactly “the physics involved in the complex movements between the player and the bat” are? I think George is talking about science versus separate human movements. The high ground is scientifically proven human movement science. Instead of debating whether we should straighten the front arm like Ken Griffey Jr. before the turn, let’s look at what the science says. The point is, nobody has ALL the answers but I’d argue we’re pretty dang close. George many people are open to new ideas or ways of looking at batting. Please expound further on your thoughts. Sorry Billmag, not sure if George is getting responses to the blog comment posts 🙁 I hope he does because I agree with you. Sounds like to me he his talking about the Psychology of the swing and not the Physiology of the swing. These statements got me scratching my head…..” By focusing on these things, it instills within the individual the belief that within themselves exists all there is needed to develop into a good hitter. The problem with thinking that way, is that there are so many body types, so many levels of strength, so many levels of flexibility, etc.”….. Isn’t what is needed to become a good hitter within us all? Isn’t the human form basically the same within us all? If you strip all the skin off the body and just watch the muscle movement of the elite swing, now replicate those movements in a person with a different body type, different strength level, shouldn’t he become a good hitter? I think the problem with “swing doctors” is the use of the word “mechanics”. Teaching mechanics, with 1, 2, or 3 cues is where you get in trouble with different strengths and body types. This cue leads to that cue leads to that cue. Now you have a swing!! NOPE! I think teaching with the science of how the body works during the swing can help a person with any body type or strength level become a good hitter. I think if you know how the body works, you can actually feel those movements working. I don’t know, just some thoughts! Matt, you’re right on the money. And I assume you’re commenting on the Perry Husband video in the Bat Drag post. The big problem is old school thinking is that every hitter is different. For reasons you mentioned, size, weight, strength level, etc. I disagree with that 100%. Humans move like humans no matter what sport they play…no matter what movement they have to perform. EVERY hitter has the opportunity to become a good or even great hitter. The recipe is: 1) practicing scientifically proven human movement principles, 2) sticky coaching strategies, and 3) Managing feedback mechanisms. Yes, genetics may play a small role. Yes, the psychology of hitting helps. You can get by without the last two things (I did through D-1 college ball), whereas you can’t with the first three. They’re critical. Thanks for sharing those thoughts Matt! You guy’s have hit the nail right square on the head. Yes, old school thinking is the main problem with hitting as well as with pitching, learning and practicing scientifically proven human body movement principles is the foundation of successful hitting and pitching, it has been scientifically proven that the body movements of pitchers and hitters to be successful should operate,function throughout their full body movement from start to finish within a series of sequenced, chain reactive body movements to be executed at the proper time in their proper sequence. Learn how to let the body do the brunt of the physical work to get the hands and bat barrel to and through contact and the pitchers body and throwing arm side assisting the arm to and through release point. Many people simply do not understand that scientific research has proven that there are or should be certain absolutes within the hitting and pitching body movements, the problem with this lack of knowledge is that people simply do not keep up with new scientific research findings they get their questions answered by old school thinkers. Three years ago I was explaining to some parents how the hip movement begins as the lift knee approaches it’s peak with no stopping and gathering a static balance and an observing lack of pitching knowledge parent told me that I was wrong and I didn’t know what I was talking about. last week during one of our high school fall ball league games one of our coaches who is a high school head coach told one of our pitchers to stop at peak of knee lift and get his balance, old school thinker. Great site, you bring a lot of excellent baseball info to your readers. Don, I know, it’s an uphill battle. But in 5 years, science-based thinking will be close to the norm, I predict. People have to stop consuming information from some the coach who analyzes video 25/7. Or from the coach with 30+ years of experience when what they really have is one year of experience over and over for 30 years. Or from the Major League player or manager, or Hall of Famer. We have to anchor our thoughts to human movement science. THEN, go to video and see who is and isn’t being efficient with their movement. Read all the comments. Great stuff. I completely agree with your one swing fits all based on science. Just one thing I wanted to add that I have noticed when working with different young hitters. Mentally they are all different. I have had kids who pick these movements up rather quickly by just watching video of major leaguers. With others is doesn’t come so easy. Point being that I believe kids learn differently. What works for one may not work for another. The goal is the same though. The key is figuring out the best way each kid absorbs it. You’re right on the money with that Fred! That’s the sticky part of coaching that I’m doing a ton of research on right now. Learning styles play a major role in this.